Classic retro dark blue and white enamel deep 8-inch plate. Often called a pasta plate. Crafted from heavy duty steel, this deep plate is coated with an ultra durable, fused-glass coating, giving it a tough, smooth finish. 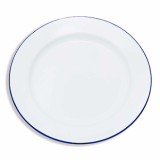 Unlike normal plates it is designed to take on a bump or two, the chips and imperfections add to its retro look! 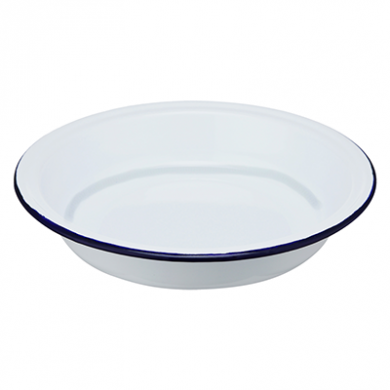 The enamelling on this plate creates a chemical and heat-resistant finish, so it's safe to use in the oven and can be washed in the dishwasher after use. Ideal for all kind of heat sources, including induction and oven - even the camp-fire!